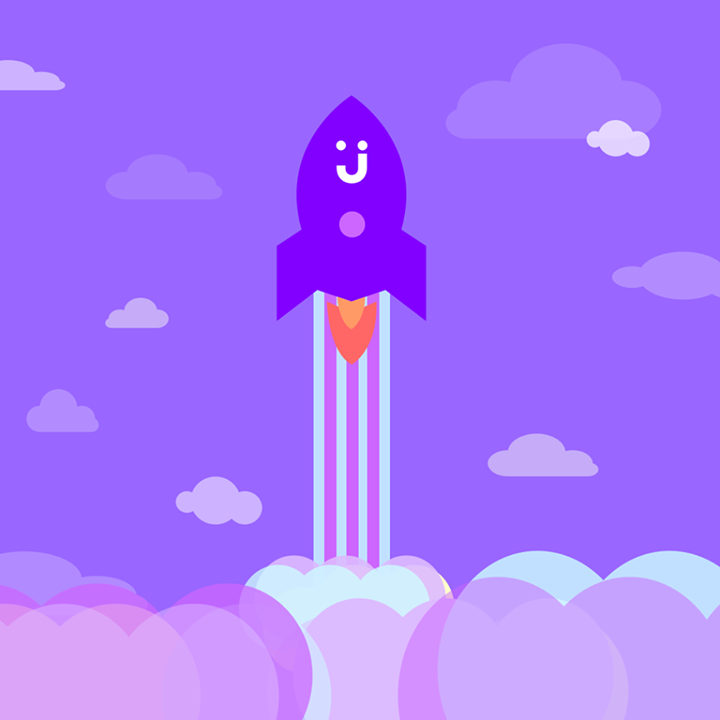 Jet.com is an exciting success story showcasing that what may seem impossible and risky investment at first can turn into an indisputable success in a matter of a short period of time. The small company that began its operations as a risky start up merely 2 years ago, is now sold at an unprecedented evaluation ($3.3 Billion) to the world’s largest retail corporation. When the company launched on July 21, 2015, its CEO, Marc Lore was quoted saying that the company’s goal is to compete with Amazon. A very bold statement at the time. Yet, the innovative founder who previously sold its former business (diapers.com) to Amazon, had a reason to remain positive. He set an ambitious, detailed plan to assure that the attempt will carry the hype it had created through its immense marketing efforts. One of the plan’s key factors involved engaging in competition by targeting Amazon biggest strength and making it better. It was all about cutting prices. 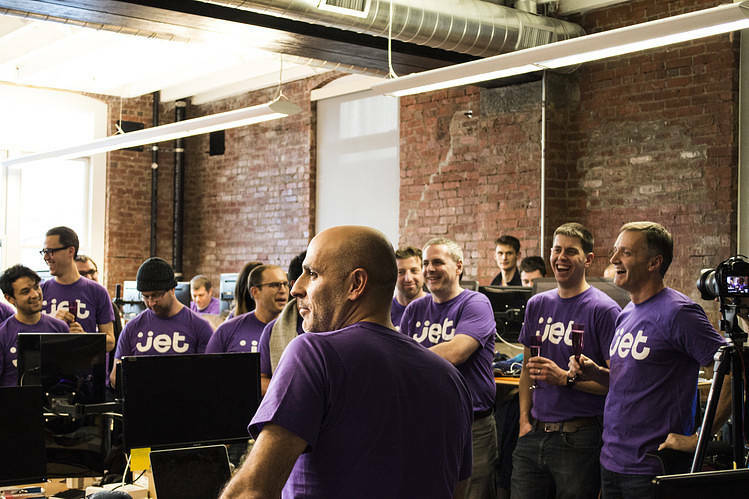 Jet.com delivered on the promise to offer prices 4-5% cheaper than any other online retailer including Amazon itself. In a sense, it used the competitor’s margin as its opportunity. Few months into operation it even dropped its initial $50 subscription fee model and began delivering awesome service at low prices. This move has had Amazon’s customers as well as other online shoppers wondering if Amazon’s Prime subscription fee of $99 is necessary for delivering such performance. The Second part of the plan involved a development of a revolutionary shopping cart algorithm. The pricing algorithm was designed to locate the most price efficient seller at every point in time and adjust the prices online based on a combination of data including shipping cost to the customer’s destination. The algorithm was so powerful since it was seamlessly synced with the most popular search engine services including like Google and Bing. This meant that every time a potential customer went to such search engine and looked for a product the algorithm calculated and offered the best price possible. This integration allowed for highly effective online marketing campaigns. To make the check out process even more efficient and cost reducing friendly the company began offering discounts for customers willing to pay using debit cards as well as for those opting out of free returns services. From that point the company continued to expand on a daily basis and offered additional product categories every month. The rapid network of more than 1800 local retailers the company has created allowed the company to close the gap compared to Amazon’s vast product selection. It is now offering more than 11 Million products including fresh produce. Despite the fact that the upstart company was burning millions of dollars every month and was far from becoming profitable in the near future, Walmart was able to see the enormous potential of the company. Walmart realized that if it plans to compete with Amazon on the lion share of online shoppers it better have an innovative management like Jet’s on its side. This opportunity was important enough for Walmart’s management to offer the biggest dollar amount ever paid for acquiring a two years old online company. 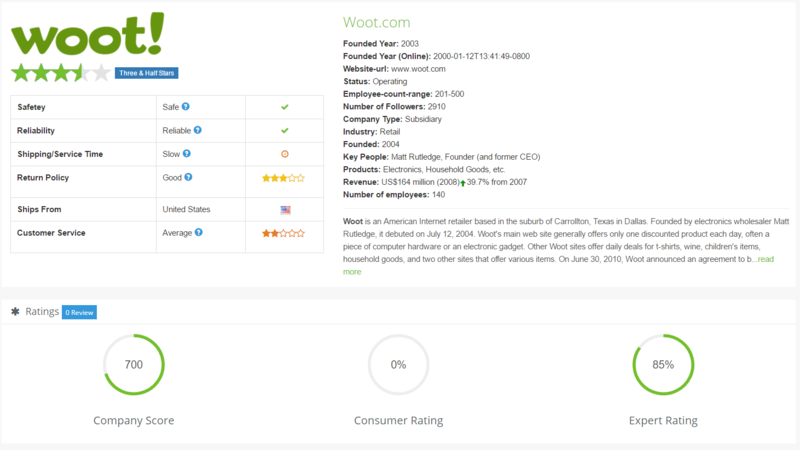 Founded on 2004 by former CEO Matt Rutledge, WOOT! 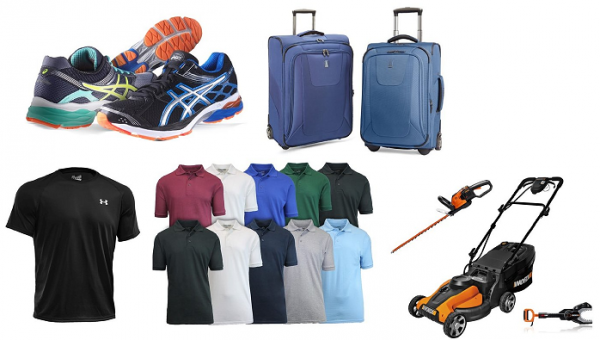 is considered one of the earliest and most popular “one deal” online retailers. The theory behind its business strategy was creating focus, hype and differentiation despite the competitive e-commerce conditions. This agenda led Woot’s founders to employ the “one-deal-a-day” notion as their business model. This model created the focus needed for offering aggressive deals with up to 70% in savings for the end consumer. The focus was possible given the narrow array of products offered at a given day. Consumers who took advantage of these deals were then incited to visit the site and shop again via sophisticated e-mail marketing approach. This unique shopping experience included unconventional product descriptions in which products were described through humorous short stories written by the sites’ content writers. (At the same time, more serious, technical information was provided below the Woot-written description). The combination of highly attractive deals with well executed social media approach created an immediate hype among consumers. On June 30th 2010, the growing popularity of the site led to its acquisition by one of the worlds’ largest internet retailers – Amazon for $110 million. Since the acquisition, the company had gone through major changes, six of its key founder executives including the CFO Rene Gonzalez, the CTO Luke Duff, and CEO Matt Rutledge left the company. Apart from the changes in management, the business model had a significant impact as well. The website began offering a large array of consumer products on a daily basis including a selection of wine, shirts, home goods, electronics and more. As previously mentioned WOOT! is now acquired by its parent company Amazon. However, the recent figures prior to the acquisition (2008-2009) show $164 million in revenue with 39.7% growth compared to 2007. On the other hand, Woot utilizes advanced email and RMA support systems. Emails are replied within 24-48 business hours by the website’s support team. The return policy allows returns within 21 days from the day of purchase. Not all products are refundable. membership rather than on companies’ performance. Hence, they fail in providing the end consumer with a good and genuine piece of advice for a future online purchase. technical details. From the moment you choose a product it takes 4-5 clicks of a button before your order is processed. Similarly, requesting an RMA# (Return Merchandise Authorization) is just as simple. Since its acquisition by Amazon, the small start up company has expanded its operation exponentially. Rather than limiting its sales to one or few products a day the company now offers a various selection of wide range of products including: electronics, fashion, furniture, toys and more! Though, WOOT! is considered one of the pioneering sites to work as a One-Deal-A-Day site, new competitors realized the financial potential associated with such business strategy and were able to build their own customers’ community using the same approach. A partial list of these sites includes: Groupon, 1sale, Dailysteals, Offers.com and many more. Despite the ever-strengthening competition WOOT! is able to differentiate itself by offering a large variety of products along with a unique shopping experience. Since its acquisition by Amazon the company had gone through a major transformation. It extended its focus beyond consumer electronics and is now offering many selections of Wine, Home & Garden, Sport goods, Toys, and shirts. WOOT! is a great modern online bargain store that represents an excellent shopping experience with deep understanding of its customer’s preferences. It achieves this goal by offering highly attractive deals on a daily basis while maintaining a vibrant social media approach with blog, emails and Facebook pages. Consumers want to make a purchase and become a member of its large community. The company’s weakest point however lies in its customer service performance. If you are the kind of a customer looking for exciting products at discounted prices, WOOT! is the right store for you. Just be sure to rmain patient as shipping times can get frustrating and getting help isn’t as convenient. The website is very safe. As a consumer purchasing at the store, you may be certain that your information is well protected by the means of the latest encryption technologies. This fact is not surprising given that WOOT’s payment methods are developed by Amazon. Great value for every dollar spent. The deals offered at the site are sold at aggressively discounted prices and in many cases are the cheapest to be found in the market. Products purchased on WOOT! will be delivered at the customer’s address in 99% of the cases. However, the delivery times are significantly longer than average. Most products are shipped within five days from the date of purchase whereas the default shipping method service offered may take up to 8 additional days before delivery. Many of the complaints against the company refer to this issue. It isn’t unusual to find customers who have been waiting for more than two weeks before the product is shipped. Not all products are new. Before you make a purchase on WOOT! be sure to check the product’s condition. Many of the items are sold as “Refurbished” or “Open Box”. The condition is normally stated in one of the top rows in the description section. Be ready to communicate via emails in case you encounter an issue as other alternatives are not available. *If you are a Woot representative and would like to comment or adjust inaccuracies you may contact us directly. Bed Bath & Beyond Inc. and subsidiaries (“BBB”) operates a chain of retail stores under the names Bed Bath & Beyond in the United States, Canada and Mexico, as well as, World Market, Cost Plus World Market, Christmas Tree Shops, and That!, Harmon, Harmon Face Values and buybuy BABY in the United States. The Company is also a partner in a joint venture, which operates retail stores in Mexico under the name Bed Bath & Beyond.The Company was founded by Warren Eisenberg and Leonard Feinstein in 1971 when they opened their first store in northern New Jersey called Bed ‘n Bath. By 1985, the Mr. Eisenberg and Feinstein were operating 17 stores in the New York metropolitan area and California. They also opened their first superstore in 1985 and changed their name to Bed Bath & Beyond. Through its retail stores the Company sells a wide assortment of domestics merchandise and home furnishings primarily for the bedroom and bathroom. The Company’s over 1,400 stores principally range in size from 15,000 to 50,000 square feet, with some stores exceeding 80,000 square feet. Bed Bath & Beyond has 1,014 locations in 2014. Additionally, the Company includes Linen Holdings, a business-to-business distributor of a variety of textile products, amenities and other goods to customers in the hospitality, cruise line, food service, healthcare, and other industries. The Company’s objective is to be the customer’s first choice for products and services in the categories offered, in the markets in which the Company operates. The Company’s strategy is to achieve this objective through excellent customer service, an extensive breadth and depth of assortment, everyday low prices and introduction of new merchandise offerings, supported by the continuous development and improvement of its infrastructure. 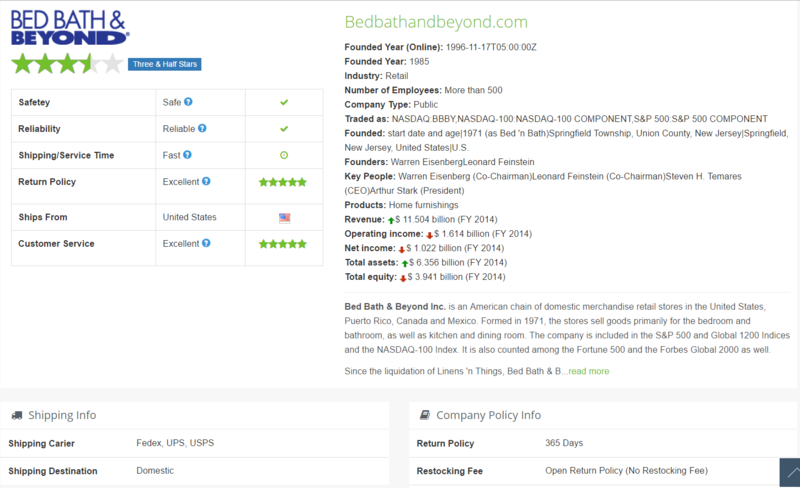 Bed Bath & Beyond is a publicly traded company on the NASDAQ under the symbol “BBBY”. The Company’s stock price was trading at $73.54 as of review date. The stock’s low point over the last year was $54.96. BBB’s fiscal year end is March 1st. Trailing twelve months as of 11/29/14 Revenue is $11.75B, Gross Profit of $4.57B and EBITDA of $1.79B. As of quarter end 11/29/14, BBB had $1.18B of Cash on their balance sheet. BBB has a Market Cap of $13.35B and 181.57M shares outstanding. The Company has exhibited single digit Revenue growth over the last 3 fiscal years and their Net Income has remained relatively flat year over year. Analysts that cover BBB expect similar modest revenue and profitability growth in the future.The Company appears to be at the mature stage of it’s life cycle as evidenced by it’s single digit growth year over year. The Company’s modest Revenue growth appears to be a result of new store openings, approximately 13 new stores openings on average per year, as well as an increase in e-commerce sales. The Company’s Revenue is largely dependent on the recovery of the Housing Market, which has seen in improvement since the most recent economic downturn. BBB is headquartered in Union, NJ. A majority of BBB’s 1,000+ retail locations are in California, Texas, New York and Florida. BBB has over 47,000 employees and offers multiple positions in its retail locations including sales and customer service associates as well as division and store managers. Average salaries for sales and customer service associates range from $9.00 to $10.00 per hour. Management positions range from $50,000 to $73,000 in annual salary.The Company appears to have a positive work environment for its employees as evidenced by employee’s reviews. Some employees voice complaints about lack of training, company’s stinginess or repetitive nature of job. However, overall employees enjoy the company’s culture and working with their colleagues. BBB does not seem to do much marketing through TV and media. Most of the marketing outreach I’ve seen is through direct mail and e-mails. The Company frequently mails 20% coupons that can be used for a single product purchased in store (not available for Online purchases). This is very attractive for larger purchases, especially for kitchen/coffee electronics or dishware with typical retail cost above $100. Additionally, they mail out a monthly catalog that typically has a $5 coupon that can be used for a single product.BBB conducts e-mail marketing in which they e-mail you 20% coupons that can be used for a single product and includes online purchases. E-mail distribution seems to be less frequent than their direct mail distribution. I believe their e-mail database comes from sales associates requesting buyers e-mail addresses during in store purchases or when an online purchase is made. Like 20.73% of website visitors, I typically go directly to their site as they are the most well-known retailer for bedroom, bath and kitchen products. I will always check their website directly when I’m seeking to purchase products in these categories. A majority of their Referrals appear to be from wedding oriented websites such as theknot.com and weddingwire.com. BBB is a top retailer for wedding registries. Many couples seeking to register will manage their registry on the website. And guests looking to purchase gifts on those registries will visit the website to make a purchase. The Company sells a combination of products purchased directly from manufacturers or wholesale distributors. Vendors are mostly US wholesale distributors/importers. Their vendors supply BBB with private label and licensed or branded goods. For example, the retailer’s home cleaning products are supplied through a distributor selling under the brand Casabella. With over 100 store locations and $11B+ in Revenue, BBB is considered a very large volume retailer in terms of orders and customer size. Bed Bath & Beyond is famous for their liberal return policy. Basically, you can return any item sold at BBB to any store, regardless if it was even purchased at a BBB. There does not seem to be any time limit on this as I’ve returned items that I purchased, without a receipt years after use. They gladly accept returns and do not require the item to be in its original condition or packaging. If you purchase online, the order will come with a pre-paid shipping label so you can process your return for free and send back to their returns processing center. It cannot be any easier. BBB has a 24/7 customer service phone number as well e-mail support. They also have a link on their Website to submit customer feedback. Resellerratings.com indicates a score of 4.67 out of 10 for customer service. The below average score is related to several complaints about delayed shipping times or discontinued products. I personally have never had any issues with timely receipt of Online orders. Packages usually arrive in less time than indicated on the order confirmation. I have found the in store shopping experience to be satisfactory. The upside is that they have knowledgeable staff and a very large selection of inventory in the categories they sell. The downside is, and this is in their NYC stores, the lines can be very long to check out and even longer when you need to return/exchange goods at their Customer Service desk. Additionally, it is difficult to find an associate to assist you and there is limited staff on the floor. The Online shopping experience is satisfactory as well. Their Website seems to be older and not as clean as other major retailer Websites such as Wal-Mart and Target. However, I have never had any issues finding an item by either entering the item in the Search box or finding it by brand or category on their dashboard tabs. They have a lot of search options such as “by brand”, “by color”, “by price”, etc. The checkout experience is pretty seamless and secure. It does not take long. My only issue is that you are not able to use the 20% coupons you receive in the mail towards Online purchases, only the e-mail offers you receive. They offer free shipping on orders above $49, which is great. They have a 24/7 Hotline that offers support in case any issues are encountered. Since the liquidation of Linens ‘n Things, Bed Bath & Beyond has few major retail competitors except Walmart, Target, J. C. Penney, and some mid-sized players like Pier 1 Imports. Companies such as Crate & Barrel, IKEA and the numerous Williams-Sonoma companies (e.g. Pottery Barn and West Elm) are also competitors. 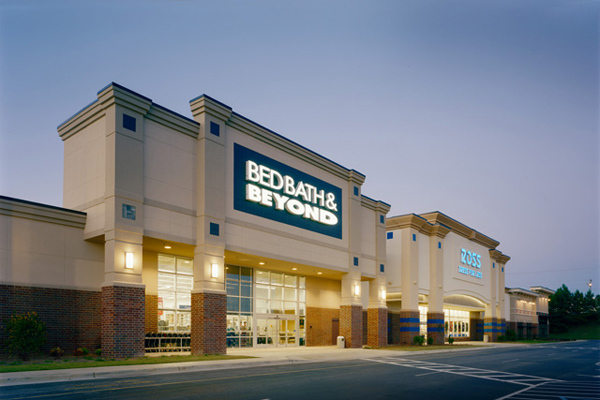 Bed Bath & Beyond is one of the only retailers with the breadth of selection in the home category. You can pretty much find anything you are seeking when it comes to a kitchen, bedroom or bathroom item. It is also where most couples decide to do their registry. While they don’t discount their products like some retailers who have frequent sales or offer below MSRP prices, BBB does frequently mail out 20% off single item coupons. I have never had any issues with their products or service and I will continue to be a loyal customer. I highly recommend this company for your next Online home purchase. *If you are a Bed Bath & Beyond representative and would like to comment or adjust inaccuracies you may contact us directly. Jomashop is a leading high-end accessories online store. It specializes in luxury watches such as Rolex, Breitling and Cartier. It is uniquely differentiated as the store with the largest variety of watch models available online. Jomashop has been in business for 29 years but began its online business only in 2000. Apart from watches the website is also known for its luxury pens, handbags, and crystal art pieces. The company is currently managed successfully by Osher Karnowsky. In 2015 the company made news by adopting automated software for online protection against fraudulent transactions. This move has helped the company reduce customer verification times from 2-3 days down to 2-3 hours. It also allowed the company to attract international sales more aggressively and resulted in higher revenue figures in recent years. Jomashop is a privately held company – Financial data isn’t perfectly accurate. The company has nearly 100 employees working in various departments. Jomashop has customer service representatives, buyers, sales personnel as well as IT specialists and web developers. Based on Glassdoor.com the company has an employer rating of 5 stars with an emphasis on the company’s culture. Employees of jomashop enjoy pizza parties and an on site coffee house. The latest salary information of a web developer was reported to be 47K a year while director wage can go up to 62K. Traffic figures of Jomashop show a healthy 3.2 Million visitors a month. The website is ranked #3 in the jewelry industry. An average visitor of Jomashop spends almost 5 minutes on the website before moving to the next. This figure indicates the immense interest of customers in the company’s line of products. The large majority of the company’s visitors is based in the U.S. (48.32%) with china being the second largest (9.37%) market. This piece of data reflects on the company’s line of products which caters to wealthy individuals looking for luxury products. Jomashop invests most of its marketing efforts to penetrate these two markets. 33.19% of the company’s visitors arrive to the website directly. These are repeat customers that are familiar with the company and went directly to type the company’s URL on their browser. 21.1% found the company through other websites using referrals and affiliate program. 38% of Jomashop’s visitors get there by clicking on active advertising campaigns published on search engines. Based on recent reports the company spends 450K annually on marketing campaigns. In addition to the marketing efforts dedicated to bring unique traffic to its website the company also operates using other platforms. Jomashop has two very successful merchant accounts on both Amazon and Ebay where the company offers its products to a wider customer base. The company orders its merchandise directly from the world’s leading watch manufacturers and accessories’ designers. When considering the purchase of an expensive product, a potential customer expects the highest standards of customer service. At Jomashop all customer service channels are available to the convenience of customers. These include: detailed ticketing system, email, 1-800 phone number and a live chat with a store rep. The site’s weakest point however, is their return policy. Despite the high price tag paid by an average consumer the return time frame is limited to 30 Days from the day of shipment. Moreover, the customer has only 5 days to notify the company of a defective product. When facing a product related problem a customer has the option of choosing to process an exchange or a refund. In case of a refund, shipping & handling costs are not refundable and restocking fee may apply if the product is not returned in the same condition or missing any packing materials.While researching the company’s customer reviews online we found that Jomashop maintains nearly perfect score in every category. It holds BBB ratings of A+ and a 9.1/10 on trustpilot.com. Overall we were satisfied by the level of customer service provided by Jomashop though we believe the company should improve its return policy. In this section we review the company’s site from the user’s perspective. Navigating the site was a breeze with many different options for locating the exact product of interest. You may use the site’s smart search, shop by brand or simply go through the site’s categories themselves. Every one of these options was user-friendly and allowed for easy access of the product. User experience was good using the site’s mobile app as well. Processing purchases via a phone or tablet is just as simple as placing an order on a personal computer.All other functions, company information, and customer service options are located in the lower ribbon of the site. Every function is accessed easily through a dedicated link leading to an associated page. These functions include all policies, accounts info and order issue resolution center.Payment for a product can be made using all credit cards (Amex, Visa, Master Card and Discover) and PayPal. Jomashop is a market leader when it comes to high-end watches, jewelry and luxury products. Some of the competitors offering similar set of products are ashford.com, worldofwatches.com and authenticwatches.com. None of these competitors poses a true threat to jomashop’s dominance as a market leader. The nearest competitor is Ashford with 1.3M monthly website visitors as opposed to 3.2M on Jomashop.com. *If you are a Jomashop representative and would like to comment or adjust inaccuracies you may contact us directly.